In the midst of Texas’ first hurricane since Ike and Dolly in 2008, we need to make sure that all members of our communities are included in emergency management and disaster recovery. Time after time, disasters have revealed the systemic inequities that exist for people and communities in vulnerable areas, making it even harder for them to recover. Inequitable response and recovery make rebounding from the next disaster much more difficult. From pre-disaster planning to long-term recovery, there are ways to address inequities and ensure that programs reach everyone in a community. Five federal agencies, including the Department of Justice and Department of Homeland Security, released new guidance in 2016 on how state and local governments can ensure that their emergency preparedness, response, and recovery programs don’t discriminate; including promising practices learned from previous disasters. Long-term disaster recovery, as well as the rebuilding of homes, infrastructure, and communities, is an opportunity to make communities safer and more resilient, to improve infrastructure, and to allow families to move to safer ground. Texas has dealt with four major hurricanes and multiple flood events since 2005: We know what works and what doesn’t. Part of ensuring what works is complying with civil rights laws during recovery. 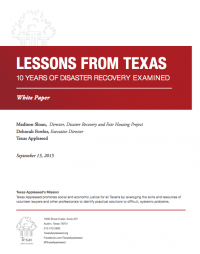 On the tenth anniversary of Hurricanes Katrina and Rita, Texas Appleseed examined the last 10 years of disaster recovery in Texas and the lessons we learned with our partner, Texas Low Income Housing Information Service. Our thoughts today are with all of the communities that Harvey has hit. As communities begin to recover, it is critical to keep in mind the lessons learned from previous storms. Done well, disaster recovery emphasizes the needs of the populations most affected by the disaster and results in recovery for the whole community; done poorly, it shortchanges actual recovery needs and results in delays, wasted funds, inequity, and prolonged hardship and displacement for Texans. For the sake of our neighbors who were in the path of this storm, let’s do it well.